Vibrant, walkable neighborhoods can help attract new residents and jobs, support existing businesses, and benefit everyone’s quality of life. Smart Growth America examined six cities using this approach in our 2016 report Amazing Place. Now we are excited to announce an in-person event exploring how these strategies are working in two particular cities—and how communities anywhere can use this approach. 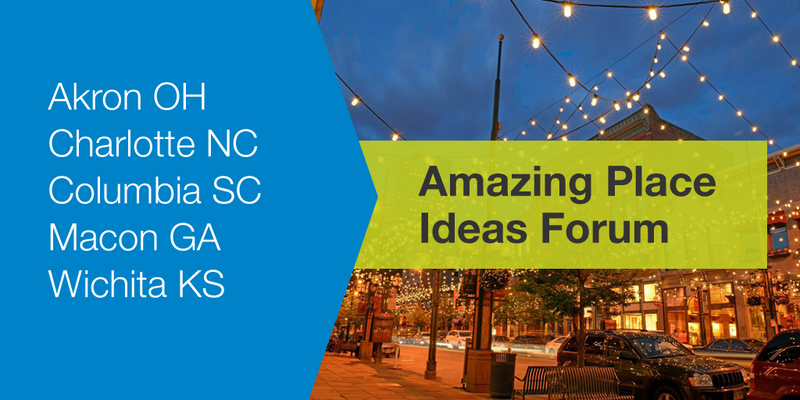 The Amazing Place Ideas Forum, presented by Smart Growth America with support from the John S. and James L. Knight Foundation, will be an experiential gathering of leadership teams from five American communities to look at innovative placemaking strategies in action. On August 29-31, 2017, the Ideas Forum will bring selected participants to Denver, CO, to see how that city has used transit, strategic redevelopment, and the arts to become a connected place that’s now a magnet for Millennials. Then, on November 14-16, Forum participants will come together again in Greenville, SC for an up-close look at how that city has created one of America’s most beautiful Main Streets and a vibrant downtown through historic preservation, brownfield redevelopment, and riverfront investment. Congratulations to these selected communities. We cannot wait to explore these issues together with you. For communities not joining in person, subscribe to our mailing list to receive updates and information about a placed-based approach to economic development. We will also be sharing the conversation on Twitter during both parts of the event at the hashtag #amazingplaceforum. Denver and Greenville exemplify the Amazing Place approach to local economic development. The five selected communities will get an up-close look at how they’re doing it, but this is an approach that any community can use. The Amazing Place Ideas Forum will show how.